How do users view Docs & Spreadsheets on the start page? We have a Google Gadget for Google Apps Docs & Spreadsheets that you and your users can add to the personalized start page. Log in to your start page at http://partnerpage.google.com/your_domain_name.com. Click Add Content on the top-left. Under Create a Section, enter http://www.google.com/ig/modules/docs.xml or docs.xml in the search box and press Go. The D&S Gadget contains a preview of your documents and spreadsheets. Once it appears on the start page, you can click-and-drag the module to any location that works best for you. Comments Off on How do users view Docs & Spreadsheets on the start page? * Enter some text and send the message. – The message text will be entered into a new online document. – The title of the document will be the subject of the email message. – Each attached document will be converted to HTML and appear as a separate document. – The title of each document will be the file name of each attachment. – With attachments, the message text itself will be ignored. You can use this as a quick way to get a whole bunch of documents online at one time, or as an adjunct to how you currently collaborate with others (by CC’ing this email address when you pass around documents). * This email address is unique to you. The address itself is long and complicated-looking just to help keep people from guessing it. * You should receive an email confirmation for each document. If you don’t receive a confirmation message, that means the document(s) didn’t make it online. If this is the case, please make sure you are using the email address shown above and that your e-mail is functioning correctly. Google had just made available Docs & Spreadsheets, a word processing and a spreadsheet program, to Google Apps, a suite of communication services for organizations. Docs & Spreadsheets lets multiple users share files and collaborate on them. Now you can add all of your external e-mail accounts to Gmail. Its pretty simple to set up. Instructions can be found here, taken from Googleâ€™s question and answer page. This feature is currently only enabled for a limited number of users. Weâ€™re working on making it more available soon. 1. Click Settings from the top of any Gmail page. 3. In the Get mail from other accounts section, click Add another mail address. 4. Enter the full email address of the account youâ€™d like to access, then click Next Step. 5. Gmail will populate the Username and POP Server fields when possible, based on your email address. Enter your Password. 6. Before you can send mail as the new address, Gmail need to verify that you own this email address. To perform the verification click “Send Verification“. Gmail will then send an email to your email address with instructions on how to verify your address. * Leave a copy of retrieved messages on the server. If youâ€™ll only be accessing your email through your Gmail account, leave this unchecked. If youâ€™d like to be able to access your mail directly from that account, or if youâ€™re accessing it through any other accounts or devices, click to select this option. * Always use a secure connection (SSL) when retrieving mail. * Label incoming messages. If youâ€™d like to automatically label all messages that are retrieved from your non-Gmail account, select this option. You can choose to use the predefined label (your email address), or you can select an existing label or create a new one from the drop-down list. * Archive incoming messages. Mail from this account can be archived directly, without showing up in your Inbox. Learn more about archiving. 10. Once your account has been added successfully, youâ€™ll have the option of setting it as a custom From address. This allows you to compose messages in Gmail, but have them appear to be sent from your other email account (learn more). Click Yes to set up a custom From address. Youâ€™re done! Gmail will now check your other account on a regular basis, and new mail will appear automatically in your Gmail account. You can disable importing at any time from the Accounts tab of your Settings page. Just click delete next to the appropriate email account. Learn more about Google Mail for mobile devices. BlackBerry users can get quick and easy access to their Google-powered mail while on-the-go. The new downloadable mail application has the same familiar look and feel as Gmail on a standard browser, so that it’s just as simple to read and respond to email no matter where you are. Thanks to “prefetching” technology, emails load faster. And the mobile application is synchronized with your mail account, so when you send an email from your BlackBerry, you can find it in your ‘Sent Mail’ next time you access Gmail from your computer. Navigate to m.google.com/a from the browser on your BlackBerry to download the free application. The application is free from Google, but carrier charges may apply. 1. Enable POP in your Email account. a. Log in to your Email account. b. Click Settings at the top of any Email page. 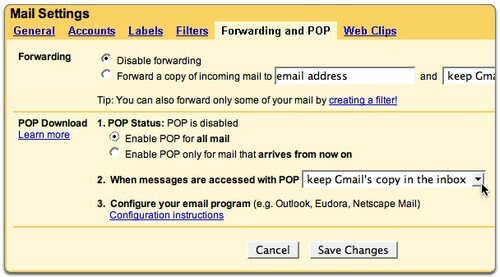 c. Click Forwarding and POP in the orange Mail Settings box. d. Select Enable POP for all mail or Enable POP for mail that arrives from now on. e. Choose the action you’d like your Email messages to take after they are accessed with POP. f. Configure your POP client* and click Save Changes. 2. Open Outlook or Outlook Express. 7. Enter ‘pop.gmail.com’ in the ‘Incoming mail (POP3, IMAP or HTTP) server:’ field. Enter ‘smtp.gmail.com’ in the ‘Outgoing mail (SMTP) server:’ field. 12. Click the ‘Advanced’ tab. 14. Enter ‘465’ in the ‘Outgoing mail (SMTP):’ field. 15. Check the box next to ‘This server requires a secure connection (SSL)’ under ‘Incoming mail (POP3).’ The port will change to 995. *The order of ‘Outgoing’ and ‘Incoming’ mail server fields varies by version. Make sure you enter the correct information in each field. 18. Congratulations! You’re done configuring your client to send and retrieve email messages. 4. Select Add a new e-mail account, and click Next. 5. Choose POP3 as your server type by clicking the radio button, and click Next. 7. Click More Settings… and then click the Outgoing Server tab. 8. Check the box next to My outgoing server (SMTP) requires authentication and select Use same settings as my incoming mail server. 9. Click the Advanced tab, and check the box next to This server requires an encrypted connection (SSL) under Incoming Server (POP3). 10. Check the box next to This server requires an encrypted connection (SSL) under Outgoing Server (SMTP), and enter 465 in the Outgoing server (SMTP) box. 12. Click Test Account Settings… After receiving Congratulations! All tests completed successfully, click Close. 13. Click Next, and then click Finish. 14. Congratulations! You’re done configuring your client to send and retrieve email messages.